Danielle Rose Russell entered the world of The Vampire Diaries and The Originals a year ago as she was cast as an older Hope Mikaelson, tribrid daughter of Klaus, for the fifth and final season of The Originals. 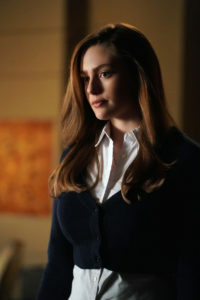 With Legacies, premiering this Thursday at 9PM ET/PT on The CW, she continues that journey as a slightly older Hope who is enrolled at the Salvatore School for the Young and Gifted. Hope’s legacy – pun intended – foists audiences into this world of all sorts of new characters that we will meet. Unfortunately due to circumstances beyond her control, we were not able to talk to Danielle on our recent visit to the Legacies sets in Georgia, so we don’t have video, but we were able to hear a bit about her new series at the Television Critics Association Press Tour this summer. Check out KSiteTV’s other Legacies content and interviews here! “I very much so fell in love with playing the character,” Russell said in an informal session in Beverly Hills, before pointing out how she has changed since we last saw her in The Originals. “Even in the way she does her makeup differently and even in the way she dresses, it’s a little edgier. It’s a little more adult. She’s definitely matured a bit and grown up a bit since things that have happened to her on The Originals, and in her attitude and being in the school itself, it has helped me really navigate how I’m going about playing her in a much different way,” she continued. Like her Legacies co-stars, she was a fan of The Vampire Diaries before entering this fictional world. And now for those who were fans of TVD or The Originals, there is something new… but one should not underestimate the ability for Legacies to be its own thing. “The Easter egg aspect of it and the history that’s infused in the show that anchors it to The Vampire Diaries universe is really wonderful,” Danielle said. “But I think Legacies deserves its own dignity as its own show, because it really is.” And as a bonus… now Danielle has people her own age to work with. Legacies premieres Thursday, October 25 on The CW.